← Should one trust PISA-rankings? No. No he didn’t. Moving on. In 1935, a rabbi in Princeton showed him a clipping of the Ripley’s column with the headline “Greatest living mathematician failed in mathematics.” Einstein laughed. 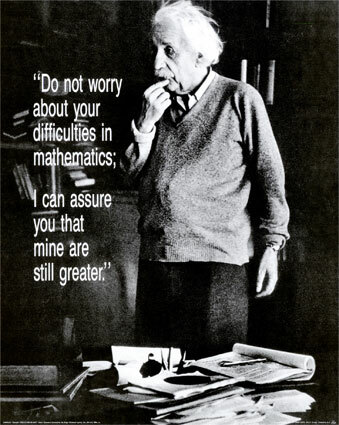 “I never failed in mathematics,” he replied, correctly. “Before I was fifteen I had mastered differential and integral calculus.” In primary school, he was at the top of his class and “far above the school requirements” in math. By age 12, his sister recalled, “he already had a predilection for solving complicated problems in applied arithmetic,” and he decided to see if he could jump ahead by learning geometry and algebra on his own. His parents bought him the textbooks in advance so that he could master them over summer vacation. Not only did he learn the proofs in the books, he also tackled the new theories by trying to prove them on his own. He even came up on his own with a way to prove the Pythagorean theory. Einstein definitely did not fail at high school. Einstein was born on 14 March in Ulm, in Germany, in 1879. The next year, his family moved to Munich. At the age of 7, he started school in Munich. At the age of 9, he entered the Luitpold-Gymnasium. By the age of 12 he was studying calculus. Now this was very advanced, because the students would normally study calculus when they were 15 years old. He was very good at the sciences. But, because the 19th-century German education system was very harsh and regimented, he didn’t really develop his non-mathematical skills (such as history, languages, music and geography). In fact, it was his mother, not his school, who encouraged him to study the violin – and he did quite well at that as well. In 1895, he sat the entrance examinations to get into the prestigious Federal Polytechnic School (or Academy) in Zurich, Switzerland. He was 16, two years younger than his fellow applicants. He did outstandingly well in physics and mathematics, but failed the non-science subjects, doing especially badly in French – so he was not accepted. So in that same year, he continued his studies at the Canton school in Aargau (also called Aarau). He studied well, and this time, he passed the entry exams into the Federal Polytechnic School. Easy. In 1896, which was Einstein’s last year at the school in Aargau, the school’s system of marking was reversed. A grading of “6”, which had previously been the lowest mark, was now the highest mark. And so, a grading of “1”, which had been the highest mark, was now the lowest mark. And so, anybody looking up Einstein’s grades would see that he had scored lots of grades around “1” – which under the new marking scheme, meant a “fail”. Do you want to read more urban legends, check here. In the summer of 1896 Einstein passed the Swiss Matura (university entrance level exams) with flying colours and was not required to retake the Federal Polytechic entrance exams. High School is not the fourth grade. Where is the evidence of how he did in fourth grade? You prooved something different than the question you started with. Actually, I did, as it was answered in the first quote already stating that Einstein was at the top of his class in primary education. Pingback: Had Einstein ADD? (video + extra factcheck-aanvulling) | X, Y of Einstein? Pingback: 48 Strange But True Facts About Albert Einstein.